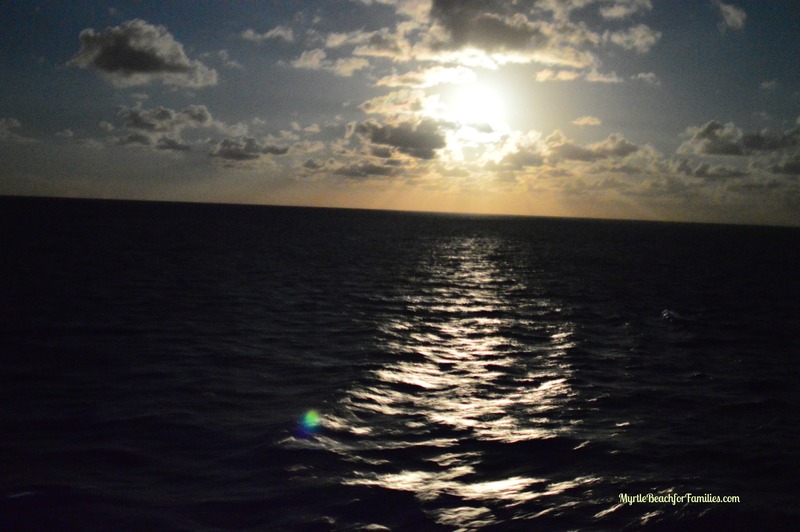 This is part three in a series about our Disney Cruise on the Wonder in October 2014. To check out the other posts in this series, click here. Our cruise left from Port Canaveral in Central Florida. From Myrtle Beach that’s about an eight hour drive. Since the ship doesn’t leave until about 5 p.m. some might be tempted to save money and just drive down there the day of departure. I beg of you, don’t do that. I also wholeheartedly think flying down is a huge cost without much gain in time. You’ll have to fly into one of the Orlando area airports. MCO will provide you with the Magical Express bus to the boat, but you’re talking about a 90 minute drive. Where to stay the night before: Upon a recommendation, we stayed at the Fairfield Inn in Titusville, FL. It was reasonable, at about $100 a night. Plus, at the time of our stay, we were offered 40% off cruise parking. That was a nice surprise! Parking for the four-night cruise we were taking would cost $75. The discount brought that cost down to $45 for us. Plus, the Fairfield Inn was clean, comfortable, and offered a free breakfast. Jackpot! The drive from the hotel to the port was short and convenient. We’ll absolutely stay there again the next time we cruise. Just be sure to call and ask about the parking discount before booking if you’re counting on it. I’m not sure if it’s regularly offered or if it was a time-limited deal. Arriving at the port: I did something wrong. I’m not sure why, but I was under the impression that because our scheduled arrival time was 1:00 – 1:30 p.m. and staterooms open up at 1:30 p.m. that we’d be able to carry on all of our luggage. Wrong. The kind young man at the curb told me in order for it to go on the ship with me, all bags would have to go through a typical airport screening machine. I did not know that. So we checked our big bags and moved on. Side note: You can check more than luggage. We saw people bringing on cases of water and other beverages (one family brought two cases of Corona. Bueno!). Just make sure your luggage tags are on everything. If you run out, just tell your curbside assistant and they’ll note your room number on a new one. Getting on the boat: We were directed into a terminal by Disney cast members. First you go through something similar to airport security. Because of staggered boarding, there was a steady stream of people, but not a crowd. We continued on and were ushered up to a counter. After an agent verifies you are who you say by showing a terminal agent your birth certificate and passport, your photo is taken and you’re are issued your Key to the World. It’s a card that opens your room, acts as a credit card should you wish you keep one on file, and tracks your whereabouts. Each time you get on and off the boat it is scanned. During this check-in process you are questioned about your health status, including recent illness and low grade fever. Getting into your room: Staterooms are typically ready at 1:30 p.m. They were running a little late on our embarkation day due to a USCG inspection. By 1:45, we were in! Here’s where I wanted to hug Kimberly Hill of Mouse Tales Travel, the wonderful agent and friend who helped us with booking this trip and suggested a veranda room, because I immediately knew we’d love our balcony. We spent a silly amount of time staring at the full moon from it for a few nights!